Angie's Suburban Oasis and Northwest Cavegirls: Happy Valentine's Day! Happy Hallmark Holiday to you all! Yes, I agree that Valentine's Day is a completely manufactured holiday meant to sell more chocolate and flowers. But I love chocolate and flowers, so that works for me! I also like the idea of a holiday made specifically to tell our loved ones how we feel about them. Yesterday my daughter and I sat at the table surrounded by stickers, colored pencils and cut-outs of hearts making cards for each other. Mine contained all of the corny sayings like "Bee my valentine" next to a drawing of a Bee. After discussing that Simpson's episode where Lisa gives Ralph a Valentine Card, I almost made one that said "I choo choo choose you", but I refrained. We had a great time crafting together for the sole purpose of telling our family how much we love them. Viva La Valentine's Day! And what's Valentine's day without chocolate? Did you know that dark chocolate is good for you? I guess you could say it's good for your Valentine's Heart! According to MyRecipes.com, "High in antioxidants known as flavonoids, dark chocolate delivers an awesome nutritional wallop. Studies show that modest amounts–no more than 1 to 2 ounces–eaten every day can reduce risk of blood clots, lower blood pressure, increase endurance, improve skin quality, and even sharpen problem-solving skills." Add sugar and eggs to a blender and blend for a couple of minutes until well blended. Add in other ingredients and blend until everything is uniform. 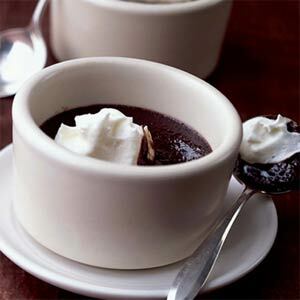 Pour into ramekins then put ramekins in a cake pan with about an inch of HOT water in the bottom. Bake for about 30 minutes at 325 or until pudding cakes start to puff up a little bit. Cakes will be very moist and very yummy!